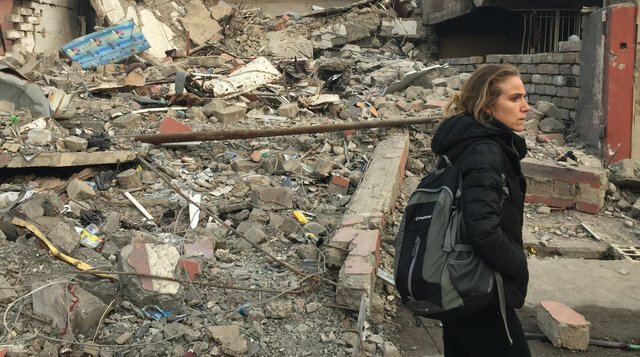 Nearly two months after spending 28 hours under siege in ISIS-held Mosul, CNN senior international correspondent Arwa Damon and photojournalist Brice Laine return to the embattled city to find out what happened after they escaped. Reuniting with the soldiers from the Iraqi Counter Terrorism Force with which they were traveling and the families who sheltered them after ISIS militants attacked their convoy, Damon takes viewers inside this harrowing experience as the battle for Mosul continues. “What drew us back was not just a professional need to return, but a profoundly personal one,” said Damon. “There is a unique bond that emerges from the type of intense terrifying ordeal we went through. But at the end of the day we had the luxury of being able to leave. They did not. As Damon, Laine and producer Hamdi Alkhshali make their way to the neighborhood in eastern Mosul, they find unit commander Major Hazem, who takes them to the soldiers who survived the attack and returned to the front line. They speak about the progress they have made in Mosul as well as the setbacks they have faced, including a recent suicide bombing attack on one of their posts. In fact, the reunion is cut short as gunfire breaks out a few doors down from where their meeting takes place. The CNN crew then heads to the house where they took shelter after their vehicle was hit. The family is still there, rebuilding their home and adjusting to life in a liberated Mosul. With a mix of shock and elation, the family members again welcome CNN into their home. They go into detail about what happened after that terrible night, saying they tried to flee their neighborhood but ISIS forced them back. They eventually got to the outskirts of Mosul, where they would spend a month hiding out wearing only the clothes on their back. One of the biggest changes in liberated Mosul is that schools are opening up for the first time in more than two years. CNN goes to one of these schools and speaks to students and teachers about life under ISIS. The stories they share are horrific, but their happiness is clearly palpable. Before the team leaves Mosul, they make another stop to say goodbye to the family who took them in during the ISIS attack. During their visit the family introduces Damon to Arwa, a 20-day-old baby girl named after her; yet another connection to the family who may have well saved the lives of both Damon and Laine. Return to Mosul airs Saturday, March 4 at 8pm GMT / 3pm ET on CNN International. It replays Sunday, March 5 at 7am ET and Monday, March 6 at 5am ET.